UCSA General Elections – Nominations Open! Nominations for the UCSA General elections are now open! Nominations close on the 31st of July at 5pm. The University of Canterbury’s Students Association is an organisation governed by 12 elected student representatives, who are advised by an outside board. This year, the top three elected positions are up for grabs, so there has never been a better time to go for these roles. There are also 9 general executive roles to run for. What’s it like to own an e-car (and drive it to uni)? Dorien Coray regularly drives an e-car to car to campus. She has recently completed her PhD in genetics at UC, plus she lectures and conducts research for the School of Biological Sciences. 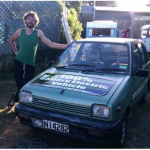 She shares the car with her partner Jasper Mackenzie (also a postgraduate student from UC), who converted the 1989 Suzuki Alto from using petrol to electricity. We asked Dorian and Jasper about what it was like to own an e-car. Why do you drive an electric car? Because it makes us cool! They are the future – the inevitable and immediate future. And it is a technical challenge. Who built it? David Newman did the original conversion and certification. We got the car from him and did quite a few modifications. We added a new battery pack, developed a charging system, and changed the engine to a gear box coupling system. One of the challenges was the need for custom designed parts and doing it on a budget. 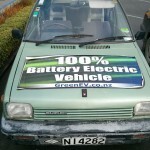 What are the environmental benefits of electric cars? Obviously you don’t use as much non-renewable resources. New Zealand’s high level of renewable (low carbon) electricity (over 70%) is an ideal match with e-cars, most of NZ’s energy comes from hydro. As the price of solar goes down it is also more feasible to charge the car off your own roof, closing the energy loop. What’s it like driving your e-car? We like that so many people want to talk to you about it. It is covered in stickers, which is a bit tacky looking, but it’s a great conversation starter. It is small and pretty fast and fun to drive. On the other hand, it doesn’t have proper heating and only goes about 45 kms before needing recharging. Living in New Brighton means you have to be a bit strategic when you go into town. Commercial models are not so limited. Tesla models have an official range of over 400 kms. Our wee one costs less than $2 to charge. Charging an e-car is currently the equivalent of being able to buy petrol at about 26 cents per litre. What sort of facilities would you need to charge an electric car on campus? Just a 10 amp socket, though a 16 amp socket would better. I built my own charger and it works in standard plugs. Many commercial cars will require a 16 amp outlet. Would you buy a new electric car? Yes, absolutely! With car manufacturers like VW saying that it will be cheaper to build electric in a few years and Tesla really pushing the market, it is only a matter of time. The infrastructure changes necessary aren’t that great. More charging stations would go a long way as not all e-cars will be premium models that can go 400 kms. As the performance and range of e-cars available improve and oil prices increase on a sustained basis, it may only be just a matter of time before we see more and more electric cars on our roads. As UC’s campus changes and grows over the next few years, now is the time to consider how e-cars can be integrated into campus by providing charging facilities at suitable locations. Entries opened for the UC Sport Design a Mascot Competition a week or so ago. UC Sport are now pleased to announce that there are some pretty sweet prizes up for grabs thanks to the sponsorship BLK. To have a shot at these awesome prizes check out the UC Sport Design a Mascot Competition a Facebook event.